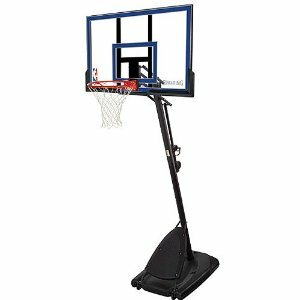 The Spalding Basketball Hoop features a 50″ backboard with authentic style board pads. The system features a 2-wheel, 34-gallon base that can be filled with sand or water to provide maximum stability and safety. The front cover of the system also acts as a rebounder during play. The system also has a 3 piece, 3.5″ round pole set at a 20 degree angle from the base. Excellent Steel Frame breakaway rim for slam dunks. Kids, Adults and everyone in between will love this basketball hoop!